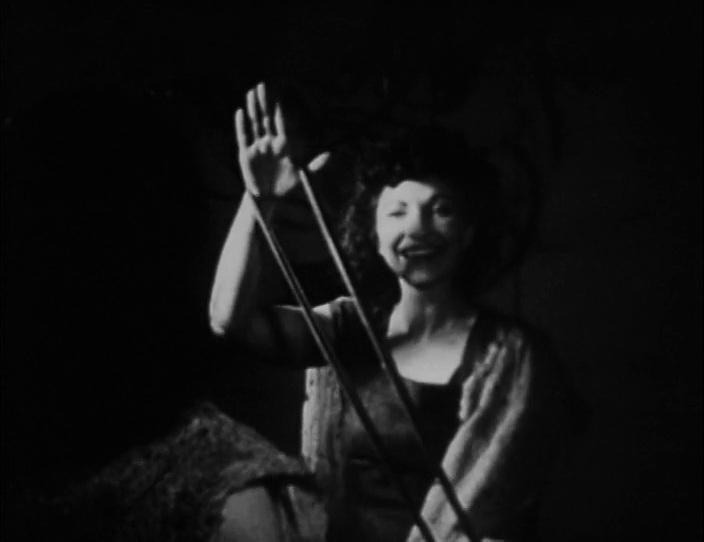 Time is Maya Deren’s raw material. Though it could be argued that temporality is the material of all filmmakers to some extent, there’s something about Deren’s short work that captures a very earnest questioning of time passing and even as an unseen character of sorts. Like Andrei Tarkovsky, Deren used time to map the questioning of her of films; creating imagery that highlighted the temporal qualities of movement. 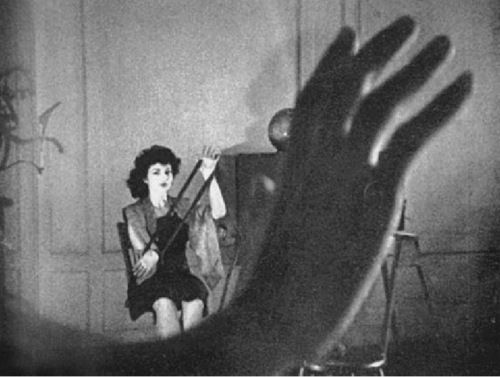 In her short film, Ritual In Transfigured Time (1946), this becomes most apparent, not only from the title suggesting a repeated set of actions but noting that time itself becomes changed and somehow more elevated by the actions in front of the camera. My interest here is not so much in the latter part of the film which falls back upon more typical imagery from Deren’s short oeuvre of slowed down movements of body, but in the opening few minutes. These short segments seem to bear no real relation to the elements that follow; a party full of dancing couples and a garden where more dancing takes place before the lead woman dives into the sea. Yet, as a set of images in themselves, they seem to question time in interesting and stuttered ways, almost touching upon visual music. In the opening segment, Deren herself is seen through a doorway in a room. The doorway is one of two with a small partition separating them. She walks between the rooms, disappearing before reappearing with some thread, moving it between her hands and seeming to talk to someone hidden in the gap between the rooms. A second woman (Rita Christiana) enters the shot, looking on as Deren continues the movement of the thread. Time seems to feel out of joint as an unusual breeze ruffles the scarf she is wearing. Her hand reaches out, as if something is guiding it and she begins to walk through the other doorway. A further door leads to the room that Deren is in, showing that somehow she was moving the material in order to wrap it but without the second required person. Her conversations were also held alone. The hand of the second woman continues to pull her towards Deren until she sits at a stool and fulfills the role of the second material holder; the movements of their bodies speeding back up to a normal pace, the second woman looking shocked. The scene goes on, a third woman (Anaïs Nin no less) entering to watch them but this is all that is needed to make the point regarding Deren’s relationship with time; the disjoint is there and strangeness abounds until the physical world has once more realigned with the temporal. In every case repetition is difference without a concept. But in one case, the difference is taken to be only external to the concept; it is a difference between objects represented by the same concept, falling into the indifference of space and time… (2004, p.26). This indifference between space and time is a beautiful way of examining the same idea of the paradox in Deren’s scene. Shadow-Time here means the separation of the cause and effect whilst the cause perceives (in this case a foreshadowing of) the effect still occurring. Essentially they become separate and yet the overall motion continues, tapping into a sense of the uncanny. It is a shadow of the actual cause to effect action – the movement of the thread via two people – and can be seen in a huge variety of films though Deren’s is the strongest example I’ve seen. Deren continues the impossible action without the necessity of the second woman there to complete the action; it is arguably repetition but strictly constructed through difference lacking concept. It is incomplete and can probably account for the strangeness that occurs in the scene. In neo-realism, the sensory-motor connections are now valid only by virtue of the upsets that affect, loosen, unbalance, or uncouple them: the crisis of the action-image. No longer being induced by an action, any more than it is extended into one, the optical and sound situation is, therefore, neither an index nor a synsign. (2013, p.6). The filming of movement that has no sense of progression, perhaps even simplistic in meaning, ruptures something that allows the passing of time to be more greatly perceived and felt. In relation to Umberto D, Deleuze refers to a scene in which a character tries and fails to light a match to heat a gas stove several times; the filming of the action having no specific relation to anything in the narrative but supplanting the character’s sense of time upon the viewer’s own perception of the filmic experience. Deren in a sense explores this though through a differing ideal; that the rupture caused in the short time of her film is a gap with which more esoteric and defined elements can sit quite naturally and even uncannily. The time-image does not imply the absence of movement (even though it often includes its increased scarcity) but it implies the reversal of the subordination; it is no longer time which is subordinate to movement; it is movement which subordinates itself to time. It is no longer time which derives from movement, from its norm and its corrected aberrations; it is movement as false movement, as aberrant movement which now depends on time. (2013, p.271). Ritual In Transfigured Time explores this in its opening segments and through a number of ideas. There is indeed an abundance of movement in the scenes, sometimes given a strange hue by being subtly reversed; body movements acquiring a stunted and sharp sense of character. Deleuze is correct in identifying that the movement does not need to be removed, hinting again at the potential of the Shadow-Time. Instead it becomes subordinate to time and, in Deren’s conception, this goes one step further. The movement is illogical and paradoxical, two bodies out of step from one another with temporality itself trying to fix the gap, the mistake in movement. It may be a narrative ploy on Deren’s part but it works equally on a formal level too; the movement briefly rebelling but the breeze of time in the film gradually bringing the bodies back together, fixing the mistake and solving the paradox.